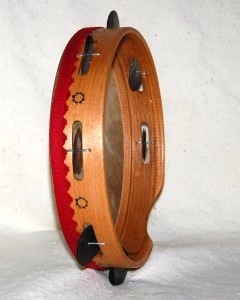 1) Tamburello for pizzica pizzica from Salento, southern Italy. A triple stroke is achieved by a turning motion of the hand from thumb to side to a downward slap. Accents in the center of the skin with the right hand thumb are sometimes executed with the assistance of sharp left hand movements in conjunction with the right hand stroke. 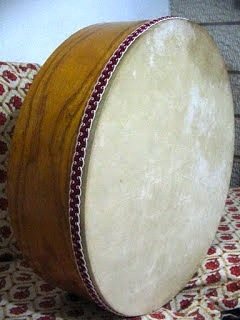 Sometimes this drum is known as tamburello taranta because of its association with the Notte della Taranta festival. 2) Tamburello from Calabira, southern Italy. The tuning is typically low and the technique makes use of the front and back of the hand. 3) Tamburello for saltarello from Lazio, central Italy. The fingetips and thumb are used in this technique. 4) Tamburello from Sicily, southern Italy. The technique makes liberal use of the index finger, left hand turning, low and high skin timbres, and variations of the pizzica pizzica and saltarello techniques. 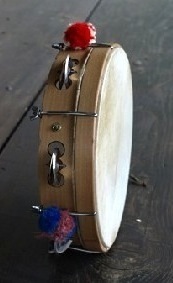 The jingles tend to have ripples near the edges while most other tamburelli jingles are smooth-edged. 5) Tamburello from Marche, central Italy. These instruments are traditionally with tuning hardware, ornately carved jingle slots, thicker and heavier brass jingles, and a string of pellet bells suspended across the inside of the frame. The playing technique is similar to saltarello playing in that the fingertips are used at the top of the frame for the main triple rhythm. A lot of sliding strokes back and forth are ued for jingle trills and the thumb (with rosin) is used for a rubbing stroke to produce a low sustained timbre. The knuckles are used in back-hand strokes in up and downward motions for duple rhythms. 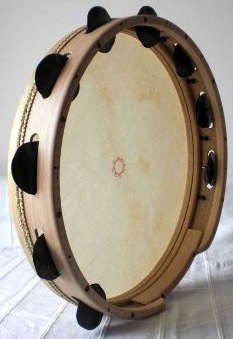 6) Tammorra featuring a deeper shell and is used for playing duple rhythms in the traditional folk music/dance known as tammorriata (or tammuriata), which is found in Campania, southern Italy. The technique involves bouncing the right hand across the surface of the skin for duple rhythms. 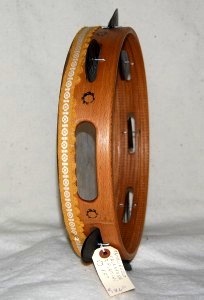 7) Tammorra muta is a tammorra without jingles that is used to accompany songs in Campania, southern Italy. It is a modern development and not part of traditional folk music attributed to Roberto de Simone. 8) Tamburello from Montemarano, Campania, southern Italy. These instruments tend to feature plastic heads and tuning hardware with modern jingles. 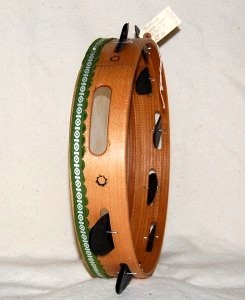 Simply put, these tend to be imported common tambourines but the playing technique is specific. When tarantellas call for tamburello accompaniment in Montemarano the players tend to use a syncopated variation of the pizzica pizzica. This tradition is relatively recent because of the influence of American 1920s Dixieland jazz on Italian musicians who were exposed to it. Identifying with a similar aspect in the American rhythm, tamburelli players in Montemarano began incorporating syncopations in their playing they heard in jazz often enough where the style became associated with the region and a tradition. 9) Tamburo from central and northern Puglia, southern Italy. 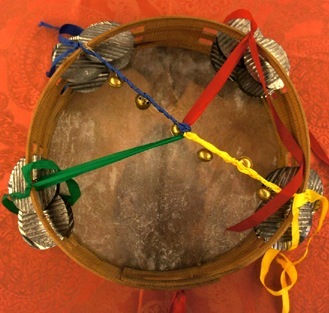 It tends to be 12"-15" in diameter with a deeper shell and handle much like a tammorra with 4 sets of jingles arranged in overlapping double pairs at each position on the drum and typically pellet bells suspended across the back of the frame. 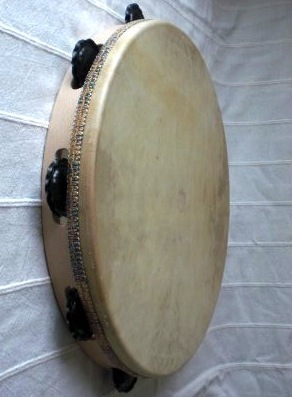 The playing technique involves prodigious use of the left hand for turning (at times with a stationary right hand) as well as right hand techniques that are similar to those used in pizzica pizzica and saltarello tamburelli traditions.